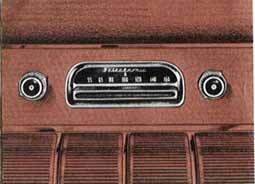 Buick's Selectronic Radio is an innovation in radio tuning and provides a simple method of station selection regardless of locality. Unlike the Sonomatic Buick Radio which automatically tunes known stations in a particular locality, the Selectronic set automatically and quickly tunes in stations all along the dial which fall within the signal strength set by the operator. Signal strength selectivity may be set at any one of four positions by turning the sensitivity knob located behind the manual tuning knob to either "MORE" of "LESS." Extreme movement of the knob toward "MORE" will include all available stations. By turning the knob to the extreme "LESS" position, nearly all stations are eliminated except strong local stations. Antenna should be "up" and fully extended. After setting the sensitivity control knob at any one of the four positions, turn on the set and move the dial indicator by either pressing the foot switch or the selector bar on the front of the set. Touch either momentarily and the dial indicator will automatically move to the next station on the dial having sufficient signal strength to fall within the range for which the sensitivity control is set. By repeating this operation intermittently, the dial indicator will "search" the entire width of the dial and automatically return to the low frequency end of the dial ready to "search" the entire dial again. In some cases, when it is desirable to rune the set manually, simply operate the manual tuning knob at the right of the dial as with any conventional radio. ANTENNA (Both radios). The Buick radio antenna is located on the left front fender opposite the windshield. The "manually-operated" antenna must be raised and lowered by hand. The "electrically operated" antenna (optional equipment on all models) may be raised or lowered from inside the car even while driving. A toggle switch mounted on the lower edge of the instrument panel to the left of the steering column raises the antenna when pulled toward the driver and lowers the antenna when pushed forward. For satisfactory radio operation, the antenna should be fully extended.